I recently posted my recipe for Memphis-inspired pulled pork. Well now it's time to share how I put some of that pork to work. 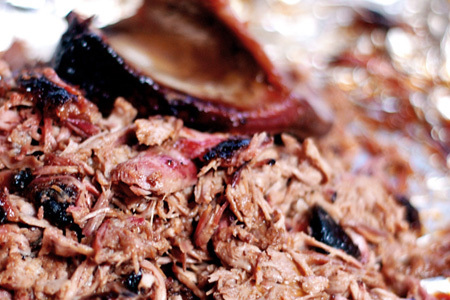 Pulled pork is traditionally served on a CWB (cheap white bun) with a drizzle or two of sauce, and coleslaw. That's it! It's simple, easy and run-down-your-arm delicious. I'm generally all about tradition, but sometimes it's good to color outside the lines a bit, so here I've added some fruitiness to the party. The combination of moist smokey pork, a fantastic raspberry-chipotle sauce, and slaw kicked up with pineapple truly elevate the sandwich. Note: If you can't find Maggi Seasoning, just use a dash each of Worcestershire sauce and soy sauce. Combine all of the slaw ingredients, except the slaw mix, in a large mixing bowl and whisk until all of the dressing ingredients are smooth and well-incorporated. Add the slaw and fold it in so that it's evenly coated. Cover and refrigerate 2-4 hours, stirring occasionally. Warm the sauce and buns. 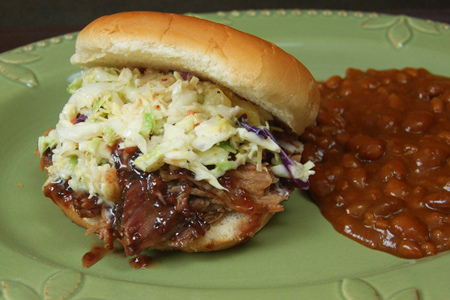 Top each bun with 1/2 cup of pork (hot, of course), 2 tablespoons of sauce, and 1/4 cup of slaw (drained of excess juice). Tip: I press the slaw in a pasta fork to remove the juice. Now that sounds good. I just used up the rest my pulled pork in sandwiches with a blue cheese and grapes slaw. It was great but I'm going to have to try it with pineapple instead of the grapes, that sounds so much better. Here's the recipe I used. I've only found that style of Lighthouse dressing at Costco, if using any others you will need to add crumbled blue cheese. 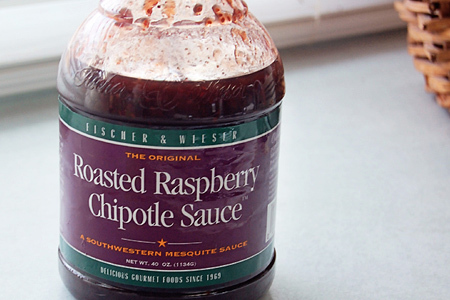 John, if you like this you need to try John Henery's Rasberry Chipotle Rub. It adds an amazing layer of flavor to baby backs! What a coincidence! Last fall I won an office appetizer cook off with mini tacos made with pulled pork, coleslaw and roasted raspberry chipotle sauce. Love that Fischer and Weiser!